So, who’s the real sultan? KUALA LUMPUR: Will the real Sultan of Sulu please stand up. Over the past few weeks, several individuals have come forward claiming to represent the Sulu sultanate and giving their views on Sabah’s long-standing illegal immigrant problem. 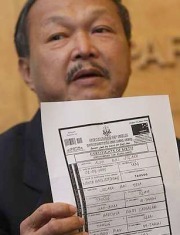 Sultans aplenty: Dr Hiew showing the birth certificate issued by the Sultanate of Sulu to The Philippines, Saturday. The sultanate, no longer a legal entity, existed before the European colonisation of the Philippines and Sabah in the 19th century, ruling parts of Mindanao, Sabah and the islands of the Sulu Sea. Following the Federal Government’s announcement of a crackdown on Sabah’s illegal immigrants, an individual identifying himself as Sultan Esmail D Kiram II, claiming to be 34th Sultan of Sulu, urged Malaysia to take a humane approach in dealing with the problem. He echoed the Philippine government’s suggestion that Malaysia grant permanent resident status to Philippine citizens who had been staying in Sabah for a long time. On Friday, soon after DAP advisor Lim Kit Siang’s claim that the Sulu sultanate had been issuing birth certificates to illegal immigrants from the Philippines in Sabah, three people approached The Star claiming to represent another person claiming to be the Sulu sultan. The three – Datuk Seri Putra Eddy T. Sulaiman, Datuk Seri Wilfred J. Kulungan and Datuk Seri Harry Lye Kok Heng – handed in a statement from Sultan Rodinood Mohamad Julaspi Kiram II, which said he was not the one behind the issuing of birth certificates to illegal immigrants in Sabah. Putra Eddy’s business card states that he is the sultan’s adviser and personal secretary while Wilfred and Lye are the sultan’s financial adviser and associate respectively. In January, Sultan Rodinood, who claims to be the 29th reigning “Sultan of Sulu and North Borneo”, was quoted in Manila as saying that he was claiming territorial rights over Sabah and was willing to take his case to the World Court. Three years ago, Sultan Rodinood asked Malaysia to pay his sultanate US$20bil (RM75bil) in compensation for getting the Philippine government to drop its claim for Sabah. Yesterday, Kota Kinabalu MP Dr Hiew King Cheu handed in a letter at the Karamunsing police station in Kota Kinabalu asking the Sabah Police Commissioner to investigate the issuance of the birth certificates by the Sulu sultanate. To add to the confusion, there is a website (www.topix.com/forum/news/weird/TANTCGDQKOM7L0769) where people are asked to vote who they think is the “legitimate Sultan of Sulu”. The names listed are Sultan Ibrahim Barjin, Sultan Esmael Kiram III, Datu Udah, Sultan Rodinood Julaspi, Sultan Aydal Aliuddin, Sultan Ibrahim Pulalon, Datu Muedzul-Lail Kiram, Aliuddin Haddis Pabila, Akijal Attih and Sultan Fuad Abdullah Kiram I. Yet another claimant to the throne is Sultan Jamalul D Kiram III, who was “crowned” the 33rd sultan in 1986.